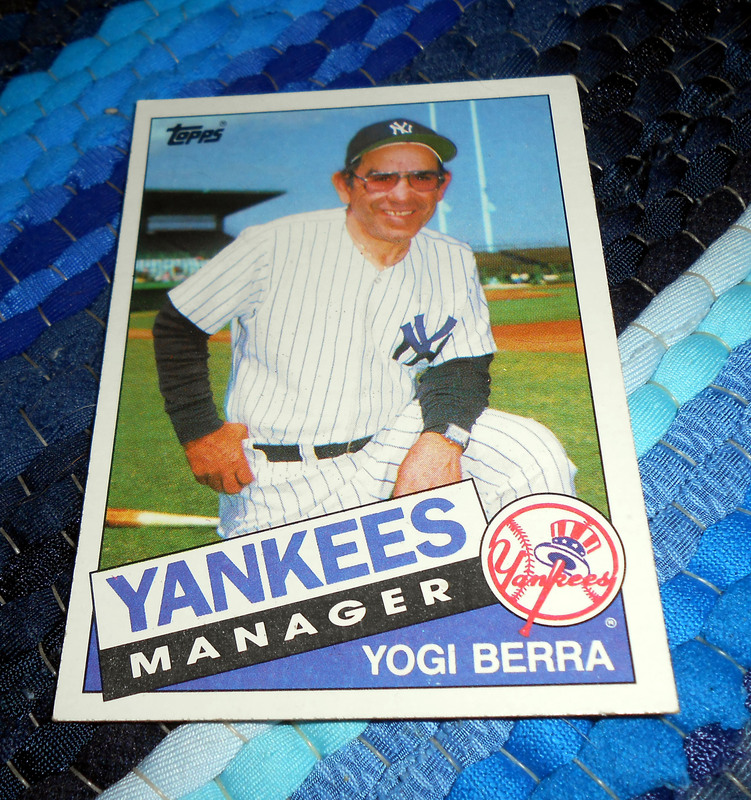 Editor’s Note: In honor of Yogi Berra, who passed away at the age of 90, it is deja vu all other again as we take a look back at a column from June 14, 2014 pertaining to the D Day invasion that Yogi Berra and so many other members of the Greatest Generation took part in. Despite long odds and adversity Yogi Berra, and the other men who stormed those beaches, proved that it is not over, until it is over. Thanks for all of the quotable memories Yogi and for your great service to America through both the Military and as an ambassador for generations of baseball fans. You truly were one of a kind. Today marks the 70th Anniversary of D-Day, which is the name given to the World War II battle involving over 156,000 American, British and Canadian forces landing on five beaches along a 50-mile stretch of the heavily fortified coast of France’s Normandy region in one of the largest amphibious military assaults in history. Led by Supreme Allied Commander General Dwight D. Eisenhower, the Allied forces stormed beaches at Normandy code named Sword, Juno, Gold, Utah and Omaha. The storming of the beaches was met by German machine gunners and artillery who tried to hold back the invasion force, almost succeeding at Omaha costing the Allies more than two thousand casualties in the opening hours. For an idea of just how gruesome this type of frontal beach assault is one need only watch the opening of Saving Private Ryan. It is easy to forget in this era of drone attacks and smart bombs that war was once much more hand to hand leading to much higher casualty rates among its participants. 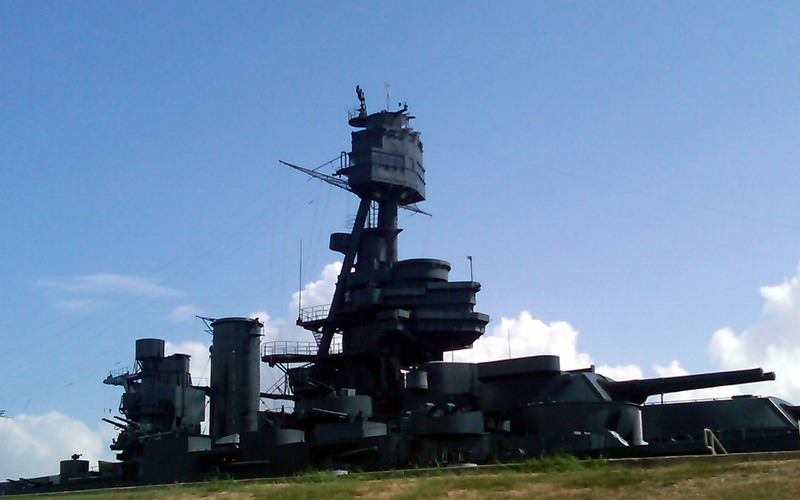 The guns on the USS Texas provided cover for the troops storming the beaches during D-Day. The flag that flew on the ship during the battle will be on public display starting today. In total, the Battle of Normandy lasted from June 1944 to August 1944 resulting in the Allied liberation of Western Europe from Nazi Germany’s control and has been called the beginning of the end of war in Europe. During the D-Day invasion all scheduled baseball games were canceled on June 6, 1944 which marked only the second time in history that games were cancelled league wide. The first cancellation of baseball games happened on the day U.S. president Warren Harding died in 1923, and the third time was when Commissioner Bud Selig stopped play for six days from Sept. 11-16, 2001, following the terrorist attacks. While baseball games were cancelled stateside on D-Day, two future Hall of Famers, Yogi Berra and Leon Day, were participating in the battle. Shortly after being drafted by the New York Yankees Hall of Fame catcher Yogi Berra was drafted by Uncle Sam. Berra witnessed D-Day 70 years ago today as a member of the U.S. Navy. According to the National Baseball Hall of Fame, 35 Hall of Fame members and more than 500 Major League players served in World War II. Many celebrations are planned today to mark the anniversary. In France various heads of state are visiting Normandy and closer to home the people of Houston, and the surrounding areas, will have their own chance to see a piece of D-Day history starting today. The Houston Museum of Natural Science will give the public an opportunity to see the 17-by-9 foot battle flag that was waving on the USS Texas during D-Day. Although the USS Texas itself has been on static display for many years, the exhibit at the Houston Museum of Natural Science marks the first time since World War II that the flag has been on public display. Whether one travels to see the beaches of Normandy, or the Stars and Stripes, it is important to remember the sacrifice of all of those veterans who stormed those beaches to help ensure the freedom that is enjoyed to this day. 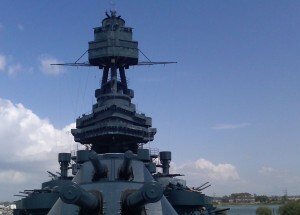 After serving in World War I the USS Texas was called into action on D-Day. Seventy years after that battle the ship remains as a monument to the people who fought and died to help bring the freedoms we know and love. Unfortunately the time to thank a World War II veteran in person is vanishing rapidly. The United States Veteran’s Administration estimates that a World War II veteran dies around every two minutes. That translates to a rate of approximately 555 veterans dying each day. By the year 2036, the VA estimates, there will no longer be any living World War II veterans. For comparison purposes the last World War I veteran, Frank Buckles, died in February 2011. A reminder of the rapid passing of World War II veterans occurred Wednesday when, Chester Nez, died at age 93. Nez was the last living member of the original 29 citizens of the Navajo Nation who were recruited by the Marine Corps to develop the legendary “unbreakable” code based on the Navajo language that was used for vital communications during battle. Just as the sacrifice made on the beaches of Normandy saved countless lives by hastening the end of the war in Europe, the Code Talkers helped end the war on the Pacific front with their sacrifice. There are countless other stories of bravery and sacrifice from the men and women of the “Greatest Generation” who served during World War II and each story goes towards the patchwork on which the nation is built. It is likely, and hopeful, that the world will not see another war of the scale of World War II. While there will always be a need for a certain amount of boots on the ground advancements in technology have greatly reduced the number of boots required to conduct modern warfare. But while the number of soldiers needed to protect freedom will continue to decline in the coming years that does not minimize the level of sacrifice made by each of the soldiers who wear the uniform. So take some time before the start of the hustle and bustle of the weekend to remember the sacrifice and reflect on the high cost of freedom paid by each generation that has gone before. And by all means if you happen to see a World War II veteran, or any other veteran for that matter, be sure to thank them for their service and their sacrifice. Now if you’ll excuse me, I have a flag to visit. It has been said that the only certainties in life are death and taxes with each leaving a void in both wallets and hearts. Yesterday the world of baseball grew a little dimmer and hearts grew a little heavier with the passing of Hall of Fame Broadcaster Milo Hamilton whose calls of “Holy Toledo” echoed from a record 59 Major League Baseball Ballparks during a 60-year career. As one of the last of the golden era of announcers, Milo Hamilton, who was 88 when he died, worked for the St. Louis Browns (1953), St. Louis Cardinals (1954), Chicago Cubs (1956-57, 1980-84), Chicago White Sox (1962-65), Atlanta Braves (1966-75), Pittsburgh Pirates (1976-79) and the Houston Astros (1985-2012). 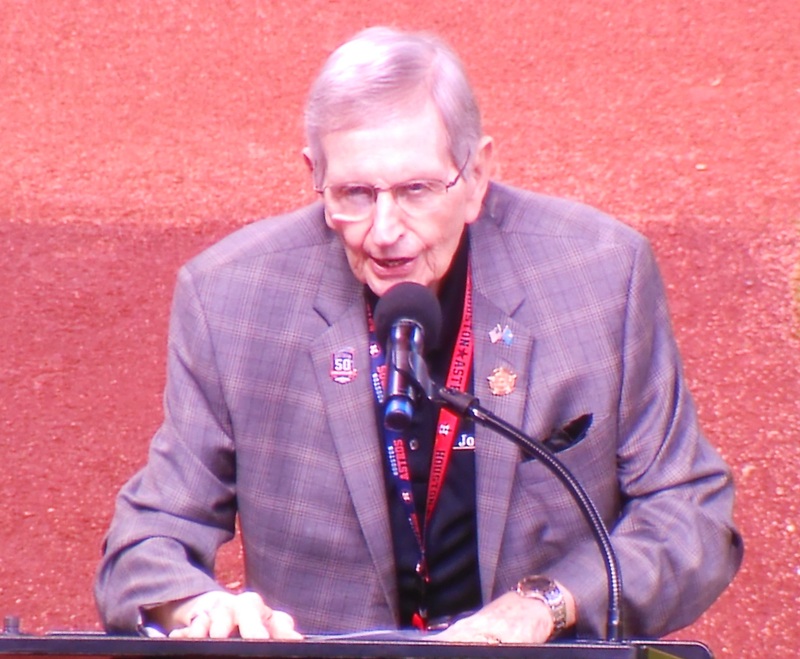 One of Milo Hamilton’s final appearances at Minute Maid Park occurred om April 18, 2015 when he honored the 50th Anniversary of the Astros partnering with NASA. 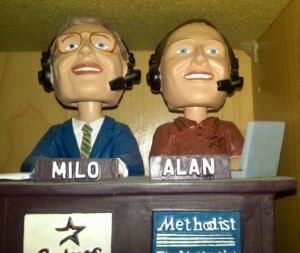 Milo’s 60 years broadcasting Major League Baseball games is second only to Los Angeles Dodgers’ broadcaster Vin Scully who has 66 years in the booth. Although retiring from full time broadcasting work in 2012 Milo remained a special ambassador for the Astros and made several on field appearances up until June of this year. Milo received the Ford Frick Award from the National Baseball Hall of Fame in 1992. While Milo’s career encompassed half of the 20th Century I did not discover him until 2000 when I moved to Houston and listened to him regularly until his last broadcast in 2012. Those 12 seasons of listening to Milo helped me feel a connection to a forgotten era of broadcasting. Although I read many books on Red Barber, Vin Scully and other great broadcasters of the Golden Age of Baseball, until listening to Milo I never had the opportunity to hear one of them call a game live. 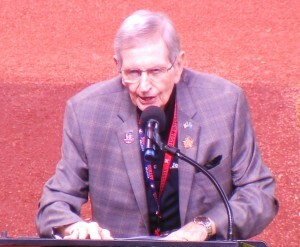 After retiring from the broadcast booth in 2012, Milo Hamilton served as the master of ceremonies for the 2013 Opening Day that marked the American League debut of the Houston Astros. Milo had a relaxed style that captured the action on the field with a conversational ease that few broadcasters can get right. Milo understood that the action on the field was what people were listening to catch as opposed to many of today’s announcers who seem to forget that a game is going on. With his Blue Star light shining whenever a player did something spectacular Milo was Houston’s version of Vin Scully, an announcer who had seen decades of changes within the game of baseball from behind his microphone and had entertained generation upon generation of fans with his Midwestern style. One of those long time fans was former President George H.W. Bush who issued a statement on the passing of his friend. While Milo Hamilton was known by generations of fans in Houston, one of his most famous calls took place in Atlanta. That memorable moment, which is forever housed in the Baseball Hall of Fame archives, is the radio call of Henry “Hank” Aaron’s record-breaking 715th home run in 1974. 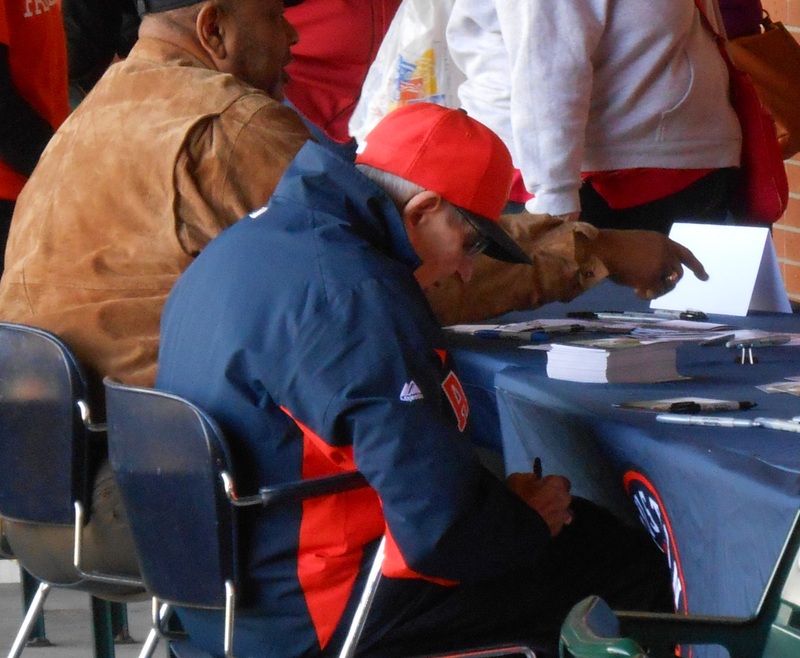 Milo Hamilton signs an autograph during the 2014 Astros Fan Fest. Ironically Milo Hamilton was behind the microphone capturing history in Houston when Barry Bonds tied Hank Aaron’s record in 2001. Other memorable calls made by Milo Hamilton included calling 11 no hitters as well as being on the call for Nolan Ryan’s 4,000th strike out in 1985. 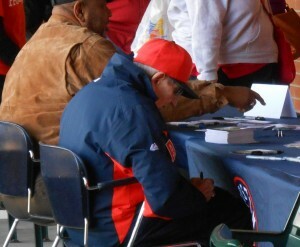 Milo Hamilton was also there to cover the only trip the Houston Astros made to the World Series in 2005. 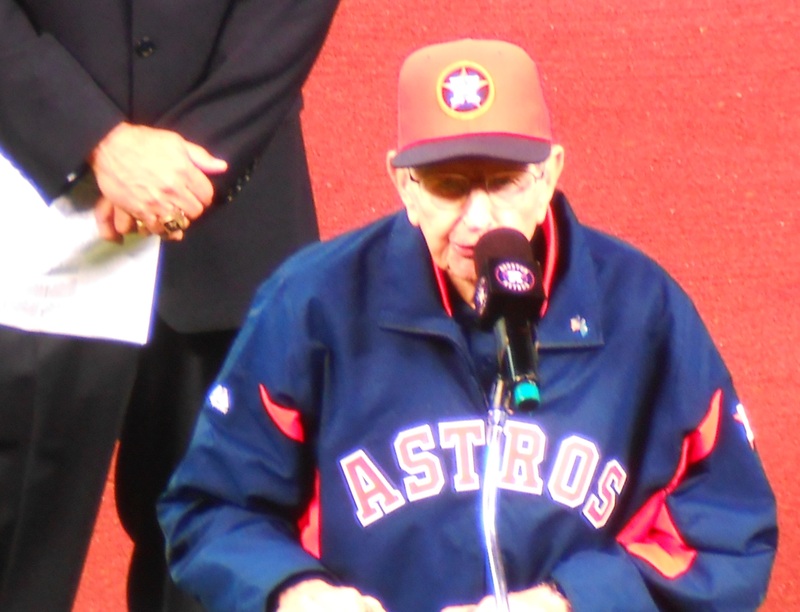 Milo Hamilton spent more years with the Astros than with any other team and was honored with a street outside of Minute Maid Park being named in his honor as Milo Hamilton Way. With the death of Milo Hamilton and the pending retirement of Vin Scully next season the world of baseball is losing more and more of the connections to the past. Milo Hamilton’s autobiography Making Airwaves is highly recommend for anyone who is fascinated by the way announcing used to be. I have had the chance to listen to Vin Scully call a few games over the past couple of years and know that there will likely never be a pair of announcers like them again. It is inevitable that the game of baseball continues to move on but it is also important to take time to remember those shoulders that the game is built upon. Although he is gone, Milo Hamilton, shown in bobblehead form will live on in the memories of generations of fans and in the archives of the Baseball Hall of Fame. A decade after their last trip to the postseason the Astros are once again a playoff caliber team, although they recently saw the Texas Rangers take over the top spot in the division. While only time will tell if this is the year that the Astros return to the World Series one can be assured that whenever they do return to the October Classic there will be a blue star shining in the heavens for them that can be seen all the way in Toledo. Thanks for the memories Milo. 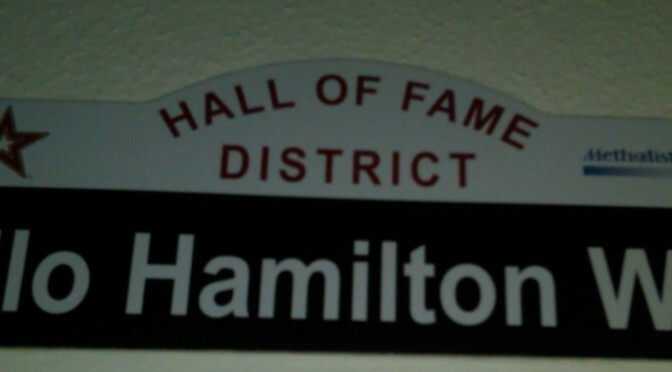 Now if you’ll excuse me, I feel like listening to some historic Milo Hamilton calls.